Here in Melbourne the Spring Racing Carnival is drawing to a close, so I thought that a couple of horse related patterns would be perfect for today’s Free Pattern Friday. Whilst Spring should be a warm time of year, Melbourne is notorious for it’s “four seasons in one day”. What better way to ward off any cool breeze at the races than with your own Dual Sided Horse Scarf by Miranda Stanbery? This scarf is double knitted, using 10ply/worsted weight yarn and 5mm needles. If you haven’t done double knitting before you might like to check out a tutorial before giving this a go; it’s not difficult but there are a few specific ‘rules’. 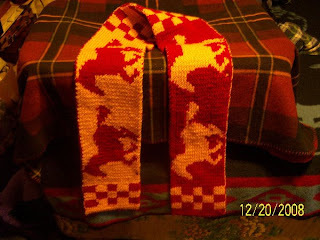 The pattern contains the chart for the running horse, and basic knitting instructions, but there is a lot of scope to change this pattern by adding other motifs, or using different yarns. See the Ravelry project page to get some ideas and see what others have done. A racing carnival would not be complete without your very own horse! I love the vintage innocence of the Trusty Old Dobbin Hobby Horse by Lion Brand Yarns, crocheted using bulky yarn and an appropriately large crochet hook. The pattern includes materials and instructions for finishing the project with the ‘riding stick’, and is written in US crochet terms (see here for Australian/UK terms). Why not make a field of different Hobby Horses, and hold your own race day?